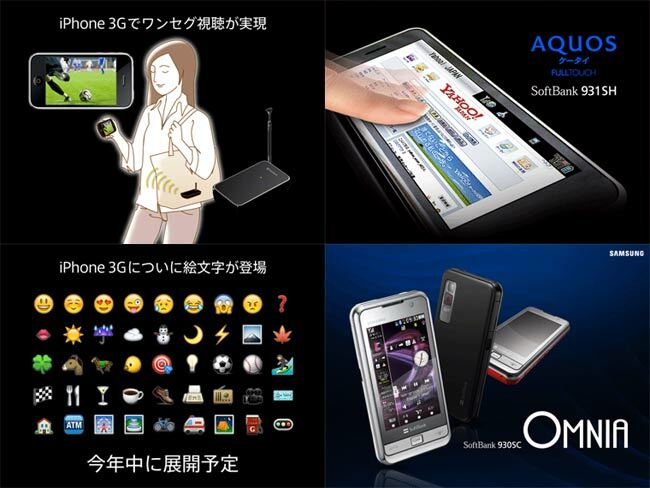 SoftBank Mobile opened a floodgate of new handsets for the year-end season with an impressive presser in Tokyo on Thursday. While the Omnia from Samsung with it’s TouchWiz UI was turning alot of heads here, it’s likely a new TV-tuner for the iPhone will pick up more attention from people overseas. The add-on device also works as a battery pack, very handy considering the surprisingly limited power which everyone is complaining about, it will apparently use an external antenna for access to 1Seg digital TV broadcasts as well. You can watch the complete event video, in English, streaming online Here.